The B73 Single lever Dual Function control to operate both throttle and shift without trim. Suitable for any type of boats with outboards, inboard or I/O power plants (except Tohatsu or Nissan outboards). Other Features: Enables easy and safe shifting by preventing accidental gear engagement unless engine is idling. Made of marine aluminum, chrome plated. Pull-out handle disengages shift for warm-up. Neutral safety switch prevents in gear starting. Power trim switch conveniently located in the handle grip enables for easy tilting of the engine. For use with all Ultraflex engine control cables except C22 or C4. C5 and C16 cables require K35 Kit - 34730U. Enables easy and safe shifting by preventing accidental gear engagement unless engine is idling Made of marine aluminum, chrome plated or powder coat finish  Pull-out handle disengages shift for warmup Includes X12 neutral safety switch which prevents in-gear starting Exceeds EN ISO 11547 standards when X12 safety switch is installed Power trim switch conveniently located in the handle grip enables for easy tilting of the engine For use with all Ultraflex engine control cables except C22, C4, C36 and MACH36. 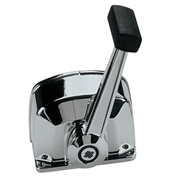 B65 - 34731 V Single lever control for one engine, chrome plated. B76 - 35312 E Single lever control for one engine, chrome plated, with trim. B66 - 34732 W Twin lever control for two engines, chrome plated. B78 - 35314 G Twin lever control for two engines, chrome plated, with trim. B73 - 35007 U Single lever control for one engine, black dome, chrome plated lever. B77 - 35313 F Single lever control for one engine, black dome, chrome plated lever, with trim. B74 - 35008 B Twin lever control for two engines, black dome, chrome plated lever. 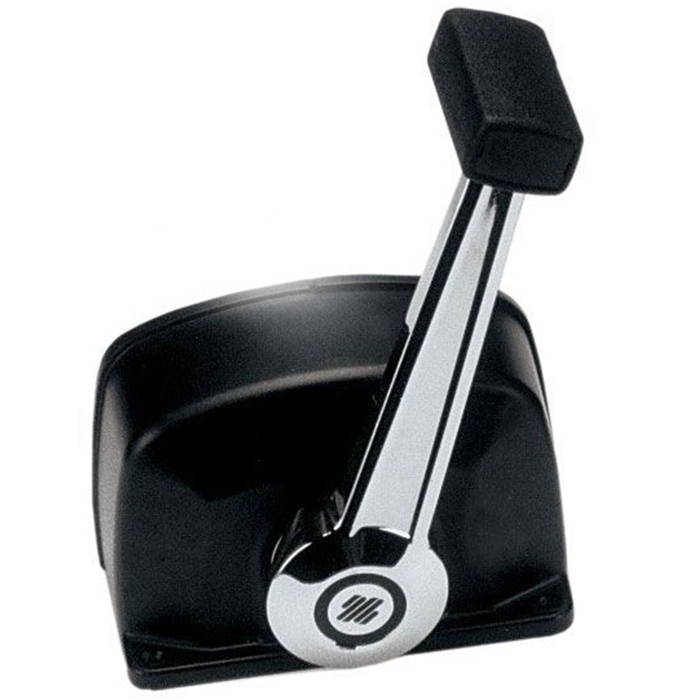 B79 - 35315 H Twin lever control for two engines, black dome, chrome plated lever, with trim.